Eddie is recovering in a Veteran Affairs hospital, after being returned home from war. His mother, father, brother, Marguerite, and Mickey Shea come into his room with a cake, singing “Happy Birthday.” Eddie wakes up to the sight and sound of his family coming in, and he screams when he realizes where he is. Eddie wishes they would leave, as he feels a sense of incredible darkness, but he tries to seem happy to have them. Everyone busies themselves, except for Eddie’s father, who stands still. Eddie makes eye contact with him, but his father only looks away, which makes Eddie feel like crying. One of the desires that motivated Eddie to go to war was his need to prove himself as a man—a desire likely inspired by his father. Yet, his father isn’t even there to pick up the pieces of Eddie’s attempt at bravery. Even in his darkest moments, Eddie’s father fails to give him the emotional support and acknowledgment he craves. While everyone else tries to make life seem normal, Eddie’s father withdraws. Ballinger-Dix, Elizabeth. 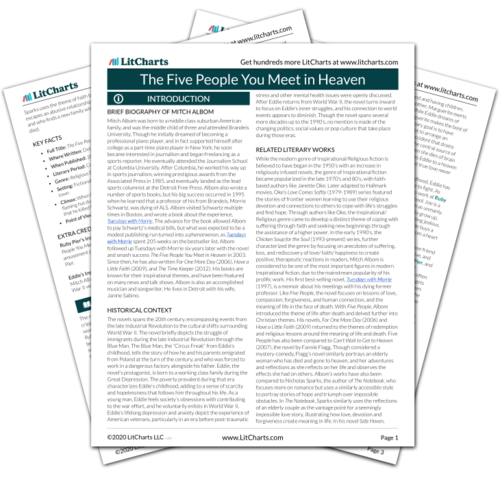 "The Five People You Meet in Heaven Chapter 19." LitCharts. LitCharts LLC, 8 Jan 2016. Web. 24 Apr 2019. Ballinger-Dix, Elizabeth. "The Five People You Meet in Heaven Chapter 19." LitCharts LLC, January 8, 2016. Retrieved April 24, 2019. https://www.litcharts.com/lit/the-five-people-you-meet-in-heaven/chapter-19.